Just a quick card share today – this was another card we made at our recent club night. 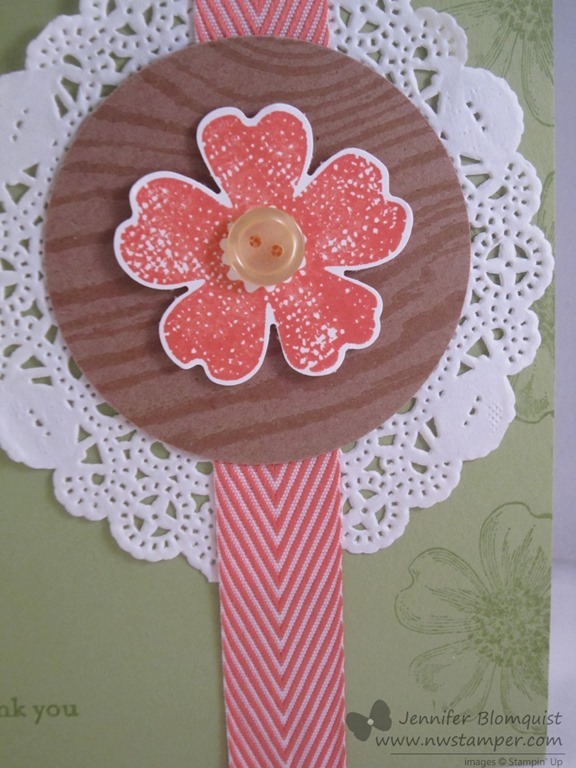 I was playing with a little bit of everything at my craft table to create this texture-rich card. The one thing that is a little different about this card, but can be hard to tell when looking at it, is that we actually cut the white Tea Lace Doily in half and overlapped the pieces so that the total size of the doily is a little bit smaller than normal. 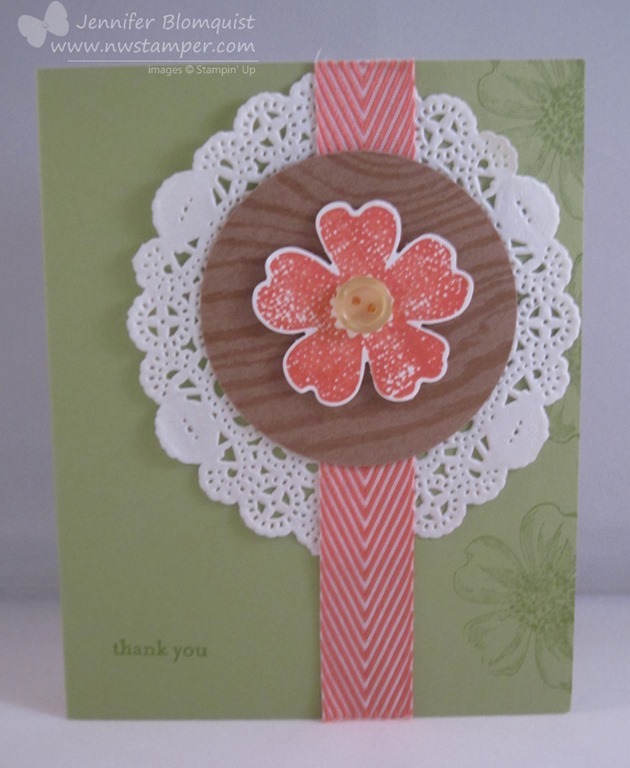 That let us have the look of the doily without it taking over the entire width of the card. The nice thing is that the Calypso Coral chevron ribbon covers up the seam where we glued together our halves of the doily so no one would ever know! Add some Naturals Specialty Composition paper and some images from the Flower Shop stamp set and you have yourself a card! I have a “matchy-matchy” mind I’m learning. When I have product kits or coordinating suites, I tend to make projects that use all the stuff from that one collection. So, that makes today’s share a bit more impressive for me since I pretty much used a little bit of this and that of things lying around my craft table to create this fun thank you card for a friend. I was playing with a few of my favorite new things (the Oh Hello stamp set and Tea for Two designer paper), but then I wanted to give the new Designer Brads a try. I used my Pink Pirouette cardstock to make the small pink circle in the middle of the brad (you use the circle from the Itty Bitty Punch pack to easily punch this out). Then I loosely formed a bow with the new Two Tone ribbon and then wrapped my designer brad around the center of the bow to pinch it together and make a cute accent. The wrapping the brad tines around the bow did use up most of the metal from the brad tines, and so I ended up adhering my bow to my card with glue dots. But all together, it was fun putting this card together and hopefully my friend liked it. 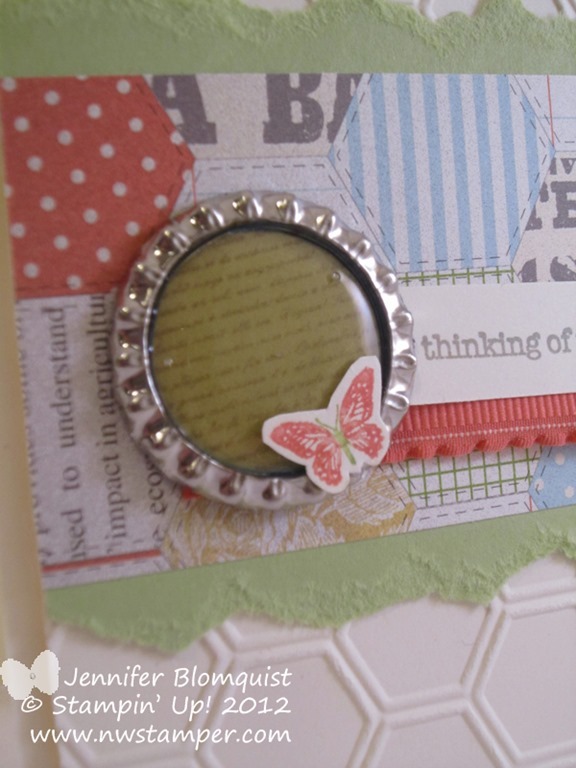 And for those of you scrapbookers out there, stop by my blog tomorrow for another installment of Scrapbooking Sunday! See you then! So I thought I would share this card I received as a swap at convention that I just loved. I thought it was so pretty and a great way to show that a few simple punches and some tied ribbon can make a big impression. I don’t know who the designer was of this card since there is no name or contact info on it (though if you do know, please let me know so I can give proper credit!) but whoever you are, thanks for the great inspiration! Anyway, hope you enjoyed this non-Christmas inspiration. I’ll be back again with more Christmas cards soon! 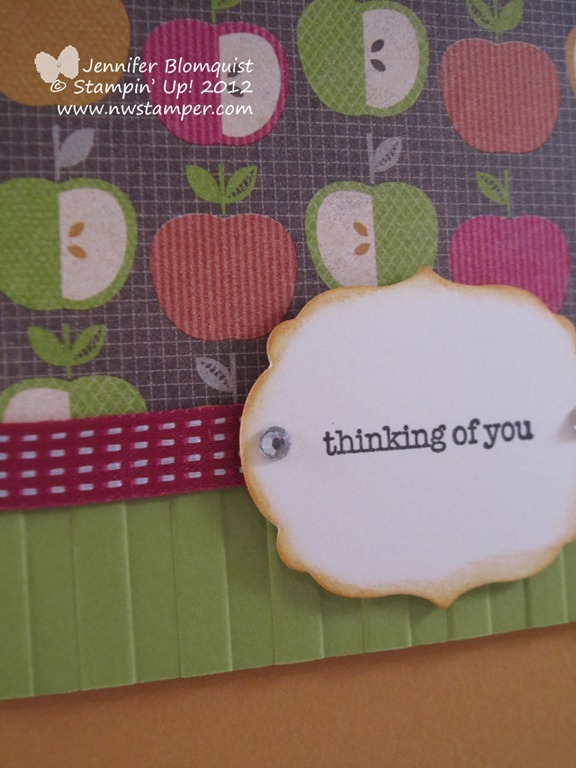 PS – Ready for the new Stampin’ Trimmer? I just want to make sure everyone had heard… Stampin’ Up! is finally ready with their new and very improved paper trimmer. It is available for demonstrators to preorder now and will be available for all orders starting in November. So get your wish lists ready! If you have any questions about the trimmer and why it is so awesome, let me know and I can fill you in. I got to play with one at Convention and have been impatiently waiting ever since :). Orchard Harvest was one of those designer papers that I loved as soon as I saw it in the catalog and so I had to get some. But then my fear of using things up kicked in and I just looked at it and couldn’t bring myself to cut it up. Well… as I look at my box of retired designer papers that I also couldn’t bear to use up… I am trying to get better and actually enjoy the papers and share them with others. 🙂 So, here is the first step – a fun fall card! I tried to mix up a few textures and dimension with this card. We have the patterned paper, embossed Lucky Limeade paper using the Stripes embossing folder, some Stitched Satin ribbon, and then the smallest sized Labels framelit for the sentiment. I have to admit though, my favorite thing about this card is that I used the colors that were found in the Orchard Harvest paper to pick the other elements of the card. And so because of that, I discovered that More Mustard and Raspberry Ripple can actually go together! I would never have thought those colors could go together but they totally do! 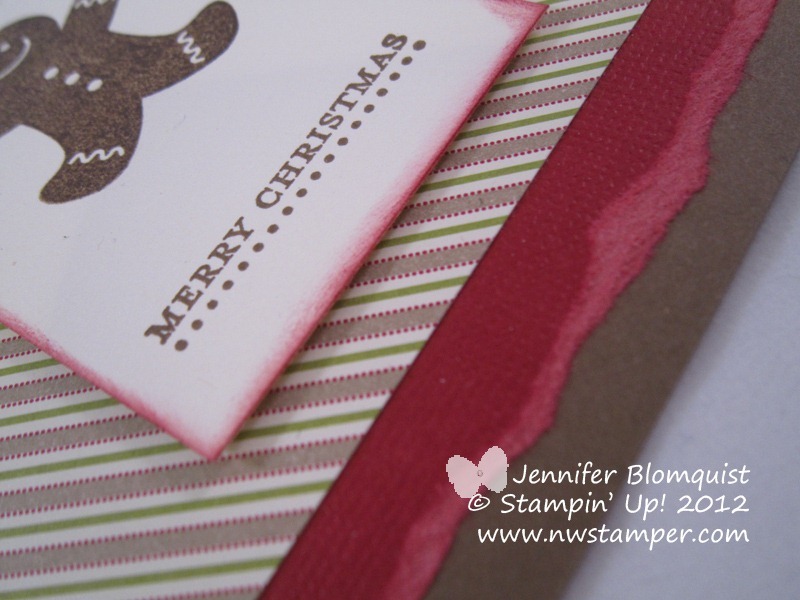 This is another fun idea for how to use your clear embossing powders. I don’t know what the “official” name for this technique is called – so I’m going to call it Peek-a-boo Emboss Resist. To get this effect, you want to find some fun pattern of designer paper and stamp your SOLID stamp image (like this flower from the Raining Flowers stamp set) onto the paper with Versamark ink. Cover with clear embossing powder and heat with your heat gun. Now, use your brayer to run a dark color over your designer paper until you can’t see the paper’s pattern any more. The embossed areas will resist the ink (you can take a tissue and wipe off any extra ink that is trying to stick around). So, your pattern will show through the inked area and “peek-a-boo” through! I will say, the hardest part is picking what pattern to show under your stamped image… at least for me. I had to hold up paper patterns and stamp images to my mom to decide what to try out for this card and so, thanks to her for this card! This was one of the cards we made for my Awesome Embossing class. I’m thinking of putting this class together as an online class. So, let me know if you would like to see this as an online class and I’ll make sure to put it together to share! Last night was the monthly team meeting for my group of fabulous Fun n’ Crafty folks on my Stampin’ Up! team. I love having the chance to chat and stamp with some amazing crafters from across the US! If you have been thinking of joining Stampin’ Up!, I’d love to have you join our fun group! 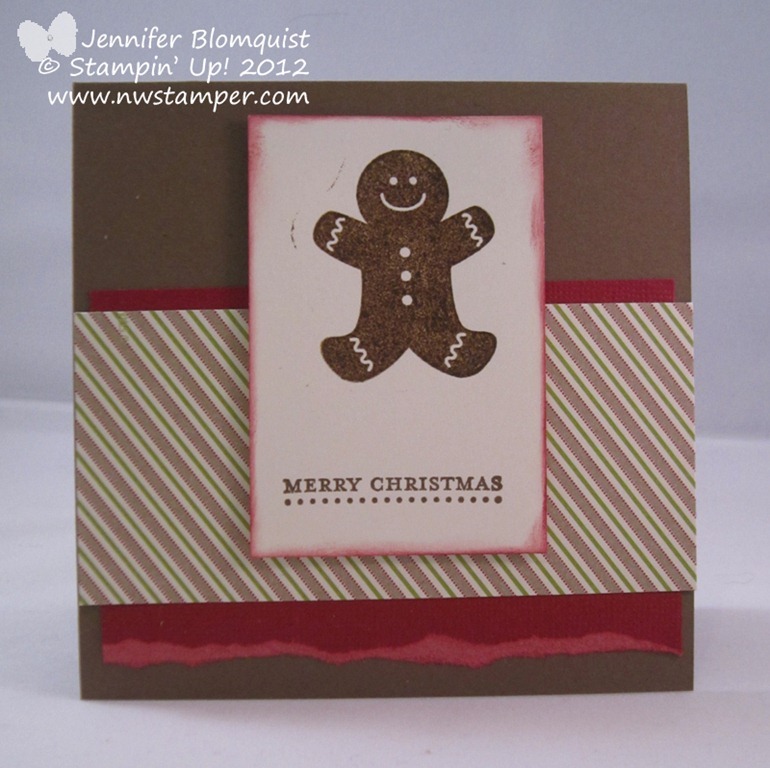 Well, I wanted to share some stamping tips and ideas and so I put together this card to share. Its one of my first playings with the new Scentsational Season stamp set. Because the versamark is layered on first when you are inking up your stamp, that means it is exposed last when you stamp on your paper – so the versamark is the top layer of ink on your paper. That makes the sticky Versamark available to grab and hold the embossing powder. I also thought I would show off some of the cool Core’dinations cardstock in Cherry Cobbler. Its just a cute way to easily add some flair to your paper edges. 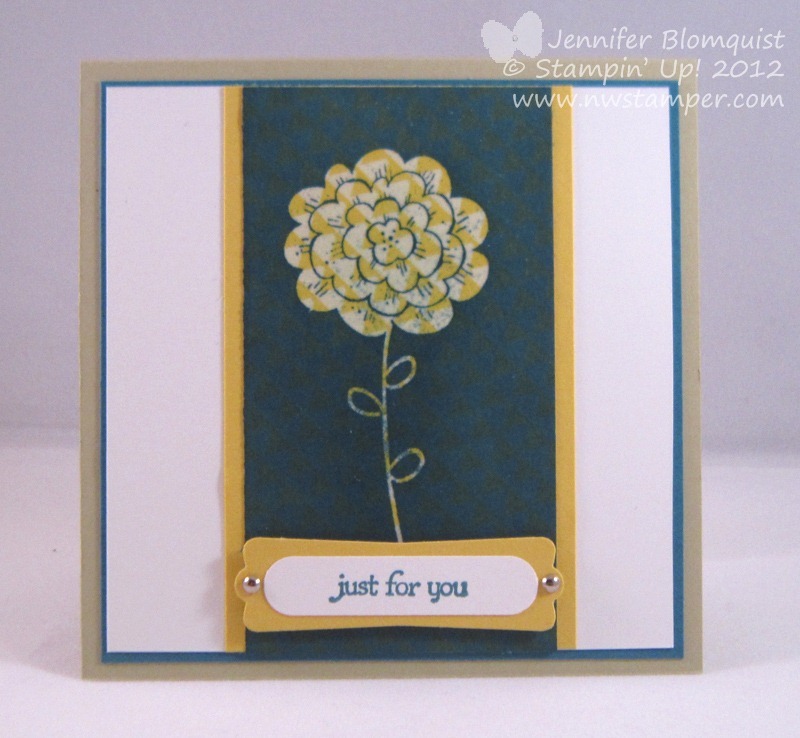 Well, I hope you enjoyed this card and stamping idea! If you have any questions about it or the benefits of becoming a Stampin’ Up! demonstrator, just drop me a line and I’d love to chat!